Recently it dawned on me to the fact we don’t trust God, and more to the point by our actions we encourage people tyo do the same while acting the complete opposite. The problem is that God uses people to be his hands and feet in this world, in fact more than once in the Bible it tells us that we will be able to do more than Christ did while he was here (Eph 3:20, John 14:12-14 are two good examples) – yet we seem to be skeptical of anything that has any of ‘us’ involved. You see the things that God accomplishes isn’t because of us, it’s in spite of us, and it’s a very delicate balance, that we seem to be so intent on corrupting, but it’s why he chose us to do his work… because we are broken, meaning that he gets the glory. To me it seems to be a matter of faith. In Mark 6 it said that Jesus couldn’t do “no mighty work” in his own home town, except for a few healings when he laid hands on people. Why? Because every one there had seen him grow up… they had seen him grow to be Mary and Joseph’s son, they didn’t believe that the Spirit of God could be in this normal looking person. And I wonder in this new global community are we doing the same? These days you can look up and see the history of almost anyone… there is no mystery anymore – and I wonder if we have lost the sense of wonder… and therefore lost faith and trust that God is God, and can do anything through ANYONE. Sometimes we ask for healing or help in a situation and nothing seems to happen so we start to take offense at God, and then we start to look at the things that don’t seem right everywhere else… and make sure everyone knows about it. I recently heard this great quote. I think lack of faith can start at anyplace down the chain… sometimes we may have heard stories about a particular healer or church that may have heard ‘rumors’ about, and the first thing we do is start is share our skepticism… and that in turn leads to unbelief in us and others, and it becomes like a cancer that seeps into the very fabric of the church. You just can’t second guess faith… other wise it’s just not true faith. Instead of being onlookers, or critics, lets really focus on praying for those who need healing, lets pray for those with the gift of healing… and while we are at it… lets stop spreading the ‘helpful observations’ that are only putting a wedge between what God is doing, what people are experiencing and their faith. Because at the end of the day God is still God. Aren’t praying vague prayers just one big cop out? When you pray a vague prayer, you can’t really tell if God answered it or not. Sometimes we don’t have enough faith to be specific for the things God has put in our hearts. What if God doesn’t answer our prayers? What if my faith is shaken? And so we start to play things safe, and then we have the God of the universe as our pocket ‘go to’ guy… and it take very little faith and very little effort and we wonder why we find ourselves stagnant, not growing spiritually, and wondering why our life is going nowhere. So what are we doing praying that we “have a nice day” or thanking God for “such a nice day”… he knows HE MADE IT in fact in Genesis it says he looked at the world he made and said “It was good”… but that’s a whole different topic. But that’s the kind of point isn’t it? The God who made the whole world in 7 days (well 6 and a day to rest) – can do so much more than just making sure we don’t crash our car… or help us find a car park close to the mall entrance. I mean is there anything worse that having to scroll through a whole lot of dribble that other ‘friends’ have posted only to see the two posts that are actually of interest to you. It’s great… is sport your passion? So my friends came up with a plan… why not create a place where you can go and talk about the things that really interest you… you know the things that you think about often and that spin your wheels. And Pass on Passions was born. I think the concept is great… specifically because I love ALL things music… so when someone mentions a new album, or posts a review on an album that they have though is great… or maybe not so great, I can read all about it. The same goes with sport, did the coach make the right decision choosing that player in that team??? Or books, was it a page turner? Or just a brick? It’s worth checking out… and maybe even signing up for. Take a look… get passionate… and then PASS it on!! One of the things I love about the Christian Music industry is that every now and then an artist (or group) bring out a worship album that is pretty special… and ‘The Shelter’ certain has potential for being one of those, with collaborators such as Mac Powell (of Third Day) Toby Mac, David Crowder and Amy Grant. 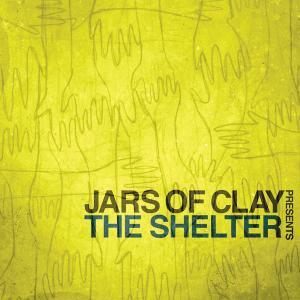 When I heard that Jars of Clay was releasing ‘The Shelter’ and that it was a collaborative effort I was a bit skeptical… as these albums seem to be pretty hit and miss (I mean can Toby Mac really work well with J.O.C.?). They seem to have a ‘make it fit’ feel rather than a organic natural feel… so will this work for J.O.C.? I really shouldn’t have been worried as there is a reason that J.O.C. are 3 time GRAMMY award winners. Where ‘The Shelter’ stands up better against collaborative albums, is the fact is the main thread weaving through the album is J.O.C. as a band… so any of the other artists on the album are adding to what the band brings to the table rather than the band conforming to the ‘guests’ styles. The Result is an album that flows really well, and it is also the reason that some of the artist like Toby Mac can fit on the album without ruining the flow of the album. On the track ‘Shelter’ Toby Mac becomes the Christian version of Timbaland adding just the tasty flavour to the song, adding enough to lift it up while Audrey Assad adds a wonderful mystical feel to the track. My favourite tracks on the the album ‘ features the new darlings of the worship music scene Gungor. ‘We Will Follow’ is a real stadium anthem where you find yourself shouting “where you lead us we will follow”. Mac Powell and J.O.C. come together for a real thigh slapper, carrying on from the Glory Revealed series with the track “Eyes Wide Open’. The album is highlighted by 3 main things, they are great songwriting, a focus on memorable choruses, and a good balance throughout the album… the album keeps momentum through the album even ‘Run in the Night’ (a track that has a feel of less speed) is still driven by a pounding driving bass, and is followed by ‘Lay it down’ a rocker featuring David Crowder… it all keeps driving – moving forward until the last two track which are ‘Love will find’ and ‘Benediction’ – two tracks about God’s love. I love how they end the album with a blessing… a real sense of the church community. I’ve listened to the album a couple of times now, and I love it. There is enough variety to keep it interesting, but nothing out of the realm of what you would expect J.O.C. to do on one of their own albums. It’s also great to see a band come together after years of soul searching to just worship the Lord our God. So how do we deal with sin? Because if we all have sinned and fall short of Gods glory then there’s no hope for us right?? You see God has dealt with sin with a two pronged approach… and both are through the death of his son Jesus. We were crucified when Christ was crucified. We have died in Christ is not merely a doctrinal position, “it is an eternal and indisputable fact” (Watchman Nee). You see the blood of Christ deals with our sins (the things that we do) – but it still leaves the problem of ourselves… you see the blood covers our sin, but we ourselves are damaged goods… we are sinners, but we want to be totally free from sin, we don’t want it to be just a quick fix right? The cross deals with us – as people… the blood deals with our sin, but the cross is were we die to this world (which we have to do to be free of this world) we die to this world and are born anew in Christ… a new creation. When we accept Christ and choose to turn from our sin, it’s almost like our old self goes back in time and dies with Christ on the cross and the new life is born. It’s something that we can’t do ourselves, for only God can let us live in Christ and deal with not only the sin but the sinner also. There have been two books that I have been reading while on a trip to Melbourne, Australia recently, they are The Bible, and The Normal Christian life, by Watchman Nee… and I was inspired to re-read the book of Romans. If you read in the Bible the book of Romans from Chapter 1:1 through to 5:11 Paul seems to be talking about ‘sins’ and from chapter’s 5:12 to 8:39 the word ‘sins’ hardly occurs once but the word ‘sin’ appears again and again… it would seem that Paul is talking about two separate subject matters. The things that we do, and the nature of why we do it, or you could say it like this – the sin and the sinner. It would seem that the fact that we sin is merely the evidence that we are already sinners; it is not the cause. Someone who sins, it would be fair to say – is a sinner, unfortunately even if it was possible for us not to sin, we still would be sinners… because we were born into ‘the world’ or as my pastor Murray Talbot would say “born into the Adam Garden” and we would still need to be saved.